We have confirmed some dates for our home track in Gainesville, FL for the first part of 2013, along with Las Vegas, Indy, Norwalk, Houston and Maple Grove. More dates and locations will be available soon. So whether you just “want to have fun”, are looking to start racing and want to drive one of our Super Comp or Super Gas cars, upgrade to Top Dragster or Top Sportsman, or you want to bring your race car to improve your skills…we hope to see you at one of these classes! 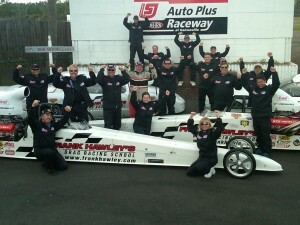 To view our Super Class video or obtain more information on all available classes, dates and locations for Frank Hawley’s Drag Racing School, visit the school’s website – www.frankhawley.com – or call 866-480-7223 (Outside U.S. 678-804-8835). The school’s also on Facebook, Twitter @Frankhawleydrs, Instagram – frankhawleydragracingschool and YouTube! A decision to attend Frank Hawley’s Drag Racing School is an easy one. Contact Paul Shields at 866-480-7223 x102 or pshields@frankhawley.com for complete details.